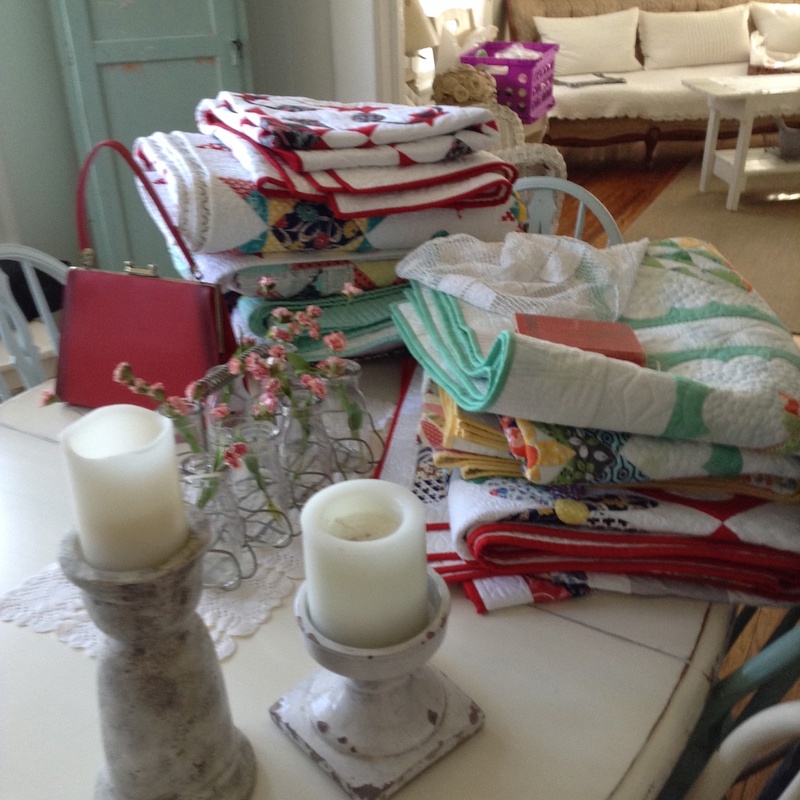 A couple weeks ago, I gathered up all the quilts for my book, swindled my sister into joining me (and bringing along lots of props), and we drove down to Overland Park, Kansas, to The Vintage House, to do a photo shoot for the upcoming book. 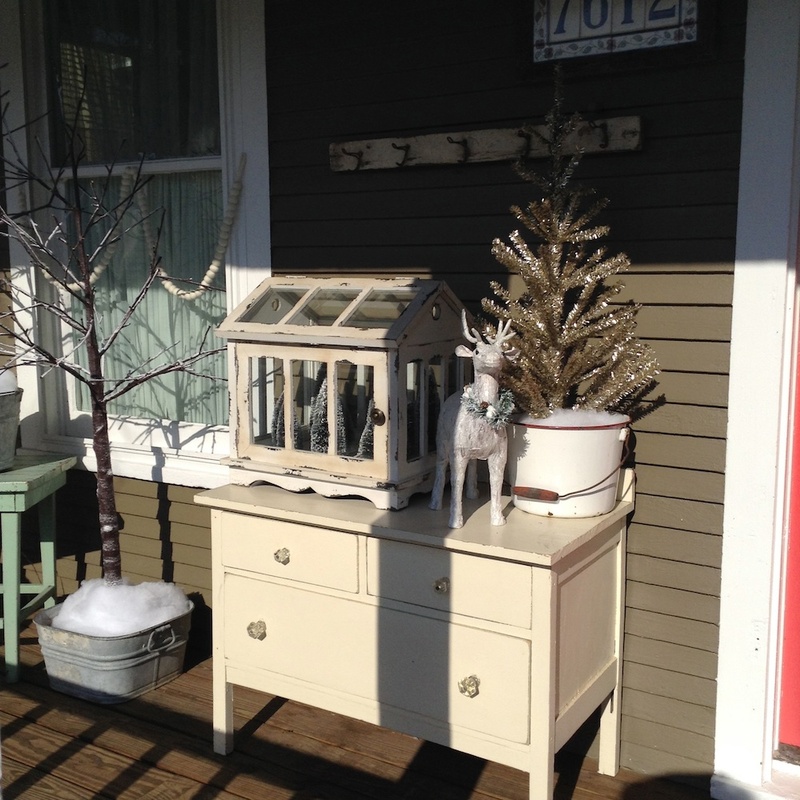 The Vintage House is THE cutest little place. 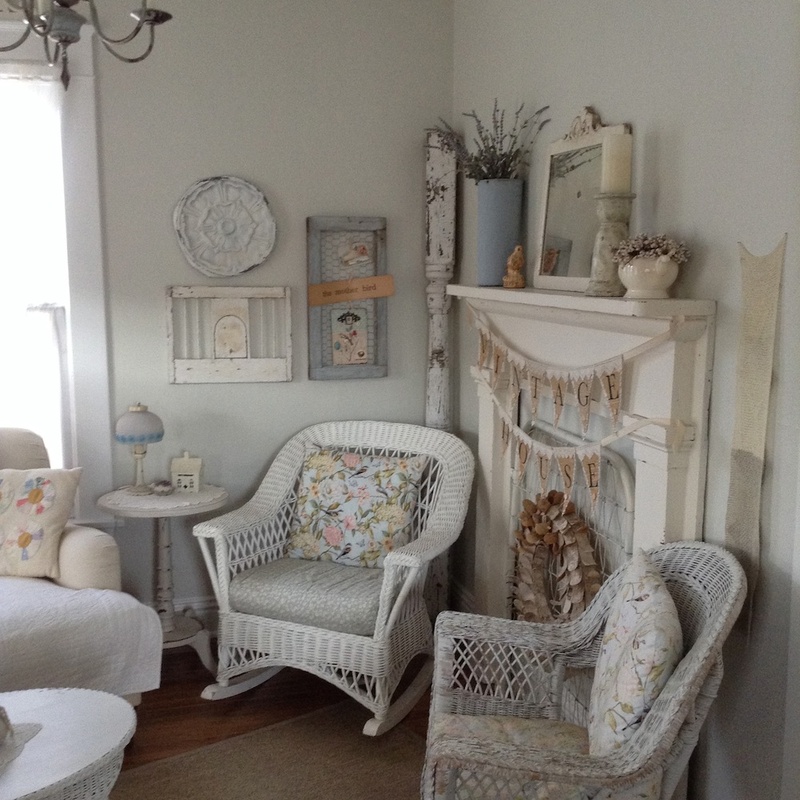 So cozy and inviting, decorated in such darling ways! 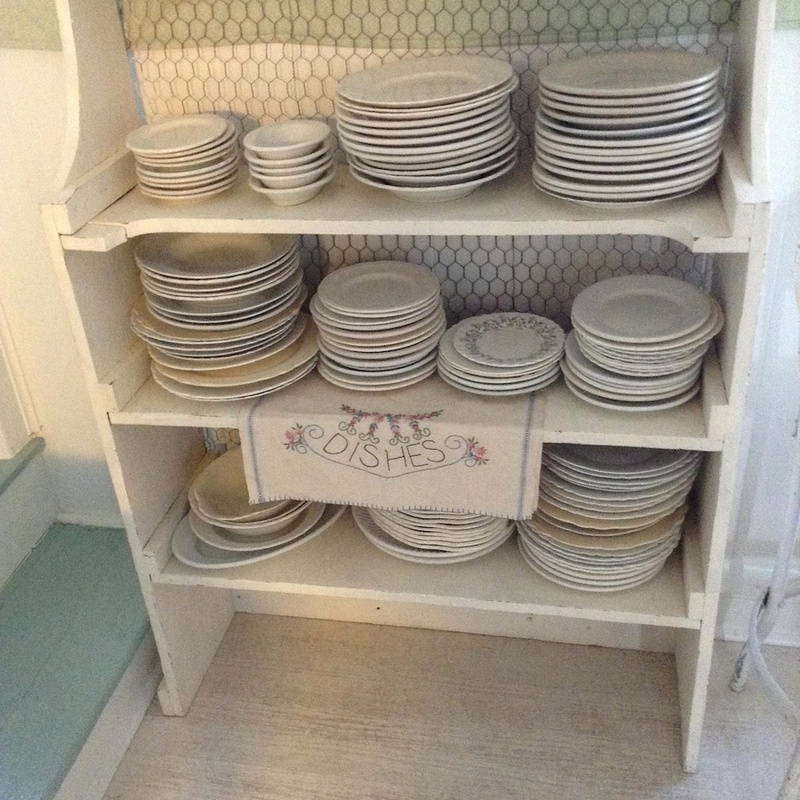 The owners rent the house out for all sorts of events, like bridal and baby showers, luncheons, and . . . photo shoots! I’ll give you a look inside some of the rooms in the house, and you might also get a glimpse of some of the quilts that will be in the book! For the photo shoot, my sister and I brought lots of props — family things, and things that belonged to our mother — to personalize the shots a bit more. We rearranged furniture and set up our own props for the shots you’ll see when the book comes out. In this one, we substituted some of the items on the table for a framed photo of Dale and Hazel after their wedding reception. Trust me, the photos in the book will be much nicer than the rough ones I took on my iPad with no flash. Aaron Leimkuehler did all the shots, and they’re fabulous — I’m so excited for you to see them in the book! 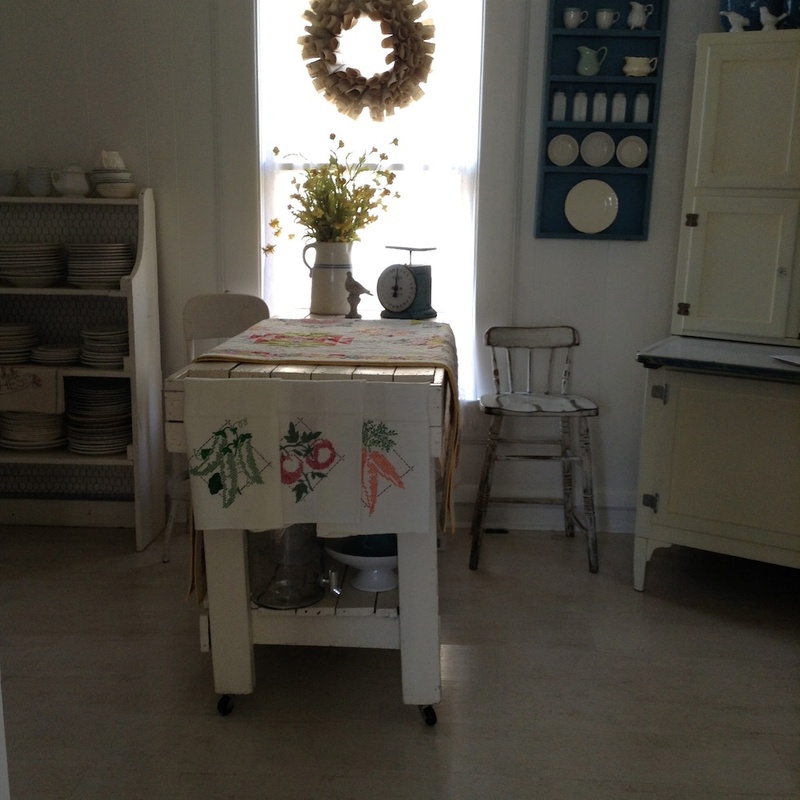 The tea towels hanging on the end of the table were made by Hazel. Silverware, etc. 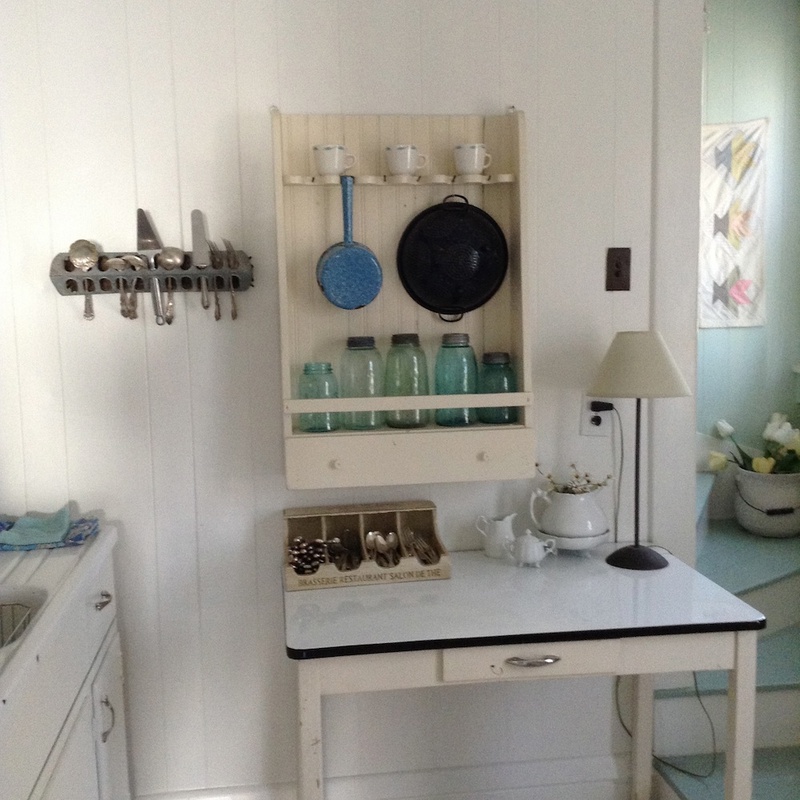 — and look how they’ve used an old chicken feeder to hold utensils on the wall! 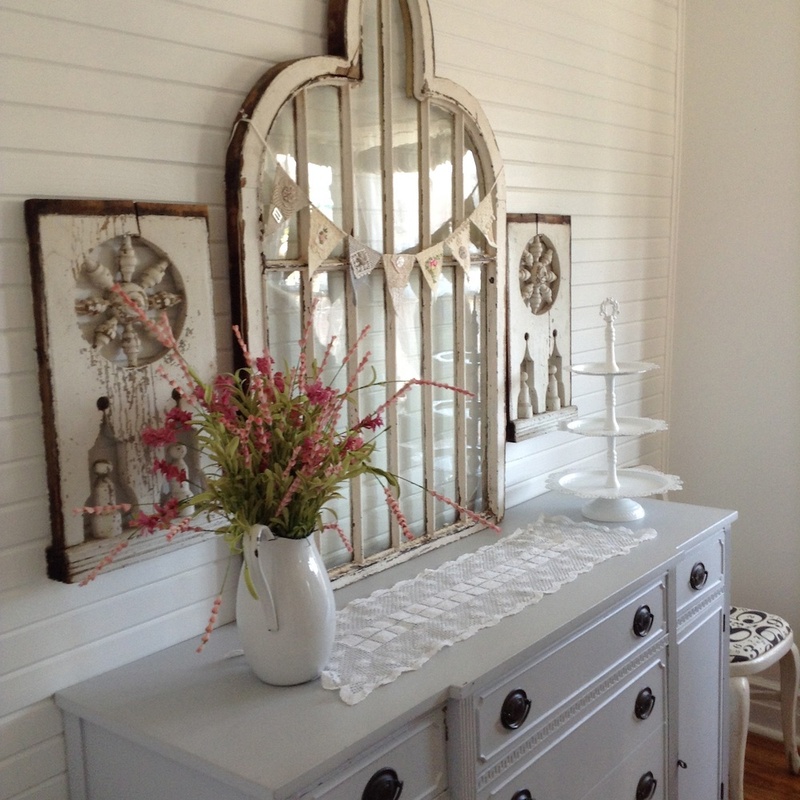 There are oodles and oodles of cute decorating ideas in this house. This house is even adorable on the outside. We did some shots outdoors as well — there were just too many cute options! 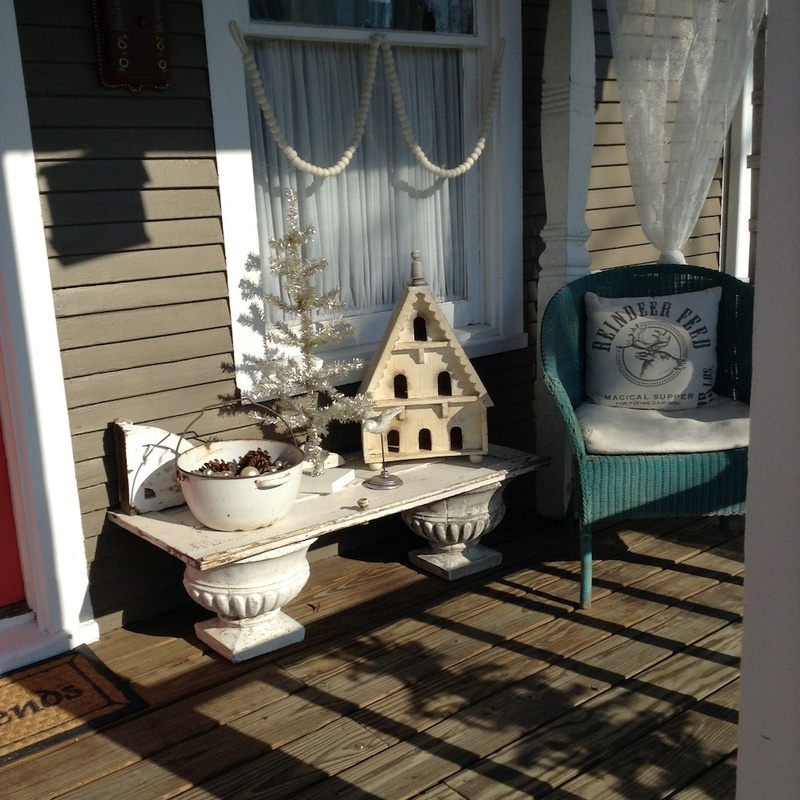 The light was not good on the front porch because of the time of day we were shooting, but I took a couple shots just to show you the decorations they had out for Christmas. 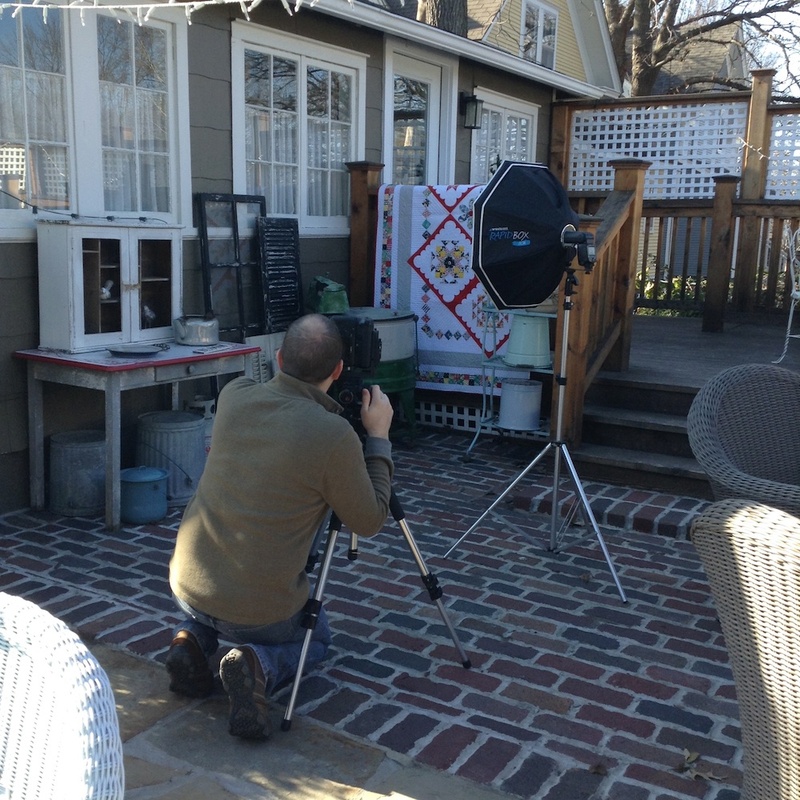 We set up a shot of the Hazel’s Diary quilt hanging on the back porch railing. I wanted to get that fabulous old washing machine in the picture! The final shots have all been chosen for the book, and I can hardly wait for you to see the quilts, and all these wonderful photos. The release date has been rescheduled for next April, but rest assured I will be keeping you posted on the progress. 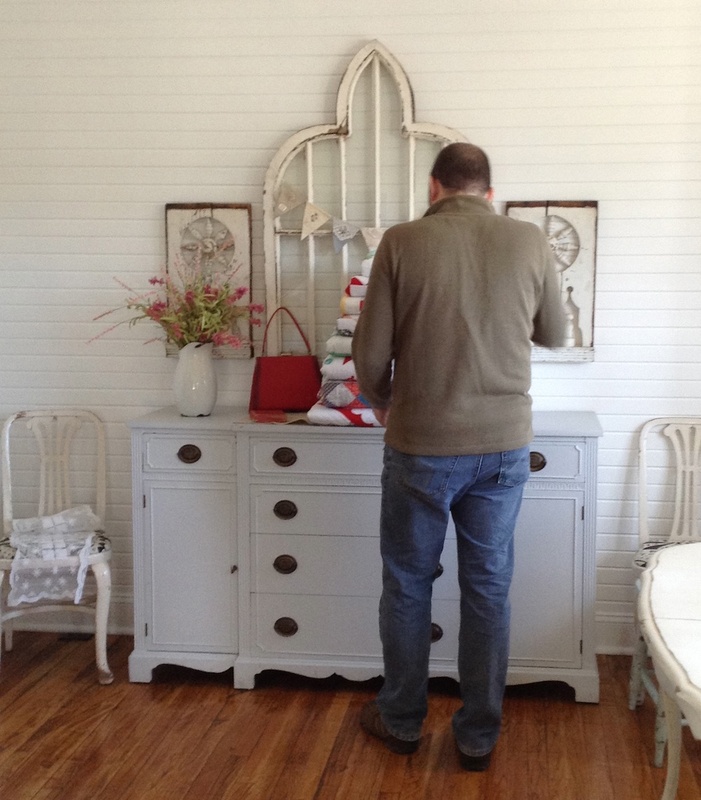 If you’re interested in seeing more of the The Vintage House — and why wouldn’t you? it’s so darling — please visit their blog HERE, or like them on FaceBook HERE. 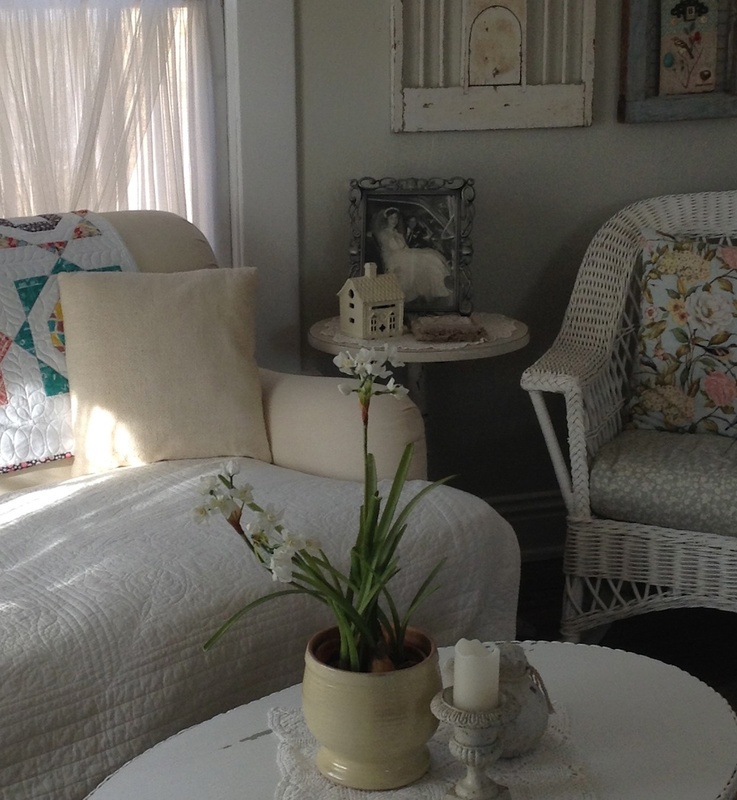 And if you’re in that area, and looking for a cute little venue for a bridal or baby shower, or some other event, consider The Vintage House. I highly recommend it! Dale came up this morn & we went to Macon & got 2 linoluems & window shades. Went to his house for dinner, then laid our linoleums & came back by Bakers & got some hamburger & stuff & fixed supper at my house. After the dishes were done we went to show at Bevier. Sounds like a full day. And they’re moving right along on house preparations. That’s good, because the wedding is only 9 days away! Baker’s is the little local grocery store in Bevier, Missouri. You can read more about it HERE. Surely Hazel got excited about going over the Royal Gorge Bridge? What an exciting and terrifying adventure that must have been. They evidently didn’t linger long, and are visiting some more folks along the way. I’m not sure who Edith, Jap, and Wanita are, but I think they’re relatives. They made pretty good time today and are now back in Kansas, so they’re getting closer to home. Vern might have driven some extra miles today to make up for yesterday’s incident. Sun. – Saw Mormon Temple this morn. We’re up in the mountains today again. Staying in Poncha Springs, Colo. tonite. I’ll be glad to get home. The car got real hot today & we got about 10 miles in 3 hrs. Daddy was tore up. OK, so the car overheating has slowed them down some, I’m sure. This has to be messing with Vern’s sightseeing schedule! 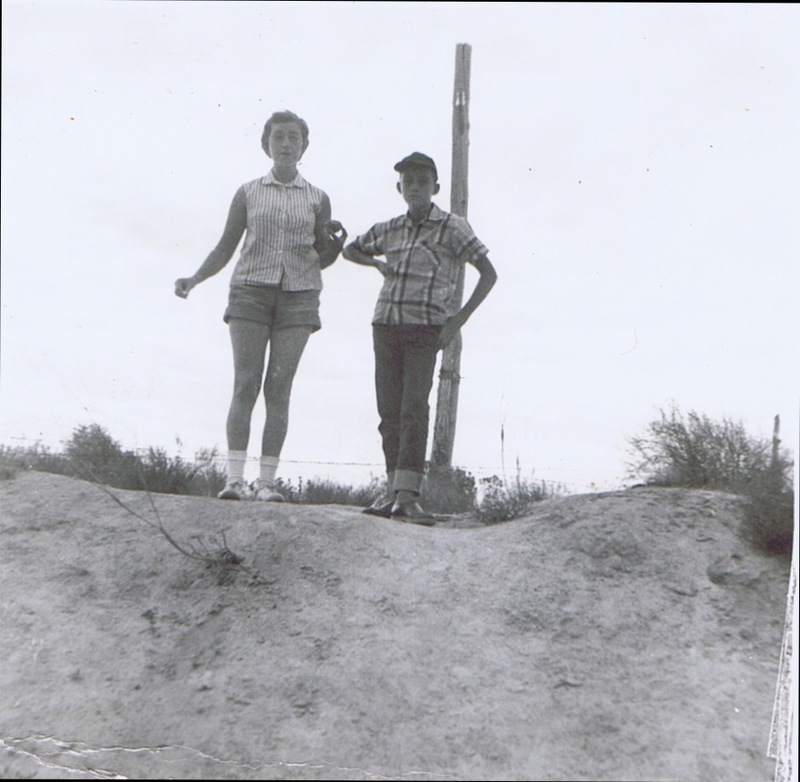 Here’s a picture of Hazel and Puz in Colorado. It sort of looks like a middle-of-nowhere waiting-for-the-car-to-cool-down bored-children-on-vacation photo, doesn’t it? We got to Salt Lake City tonite & are staying at the Chauteau Motel. Went to a beach at the lake. We did’nt go in. I didn’t even get out of the car. Wrote to Dale when I got back. Yep, I’d say Hazel’s a bit tired of the trip, and just wants to get home. But they’re still sightseeing their way across the country, even if she’s not happy about it! I wonder what tomorrow’s adventures will be? Came thro desert most all day today. It was real hot. Got to Las Vegas tonite. Staying at the Emerald Motel. Me & Mom washed out some things. Want to get to Salt Lake City tomorrow night. I’m tired. Bye. Vern sure has planned a route for them to see as much as possible! This is Day 12 of their trip so far. Staying at the Emerald Motel in Vegas sounds ritzy, but I’m sure this was before the Emerald became very ritzy. They’d better get a good night’s rest — they have over 400 miles to go tomorrow! We got to Fresno this aft. & went to Hermans & Ouida’s. He helped us find a cabin (got a real nice one) & then we had a Chinese dinner. Aft. watched T.V. & talked. Its after 12. Wrote to Dale, tonite – as always. Hazel doesn’t mention going through San Francisco, so it must not have been memorable enough for her. I think she’s tired of traveling! Herman and Ouida must be friends or relatives they’ve stopped to visit with.